At my mother’s group this week there were a lot of newborns--three weeks old, a couple even younger--and I was hard pressed to remember when Tucker was that small. In fact, I asked one mother of an impossibly tiny baby how much her son weighed at the moment, and she said 8.5 pounds. That’s what Tucker weighed when he was two weeks old. But that baby was SO SMALL. And so sleepy and curled up! I suddenly understood why my mom friends with older kids got all nostalgic when they first held Tucker... Even after three months I have already forgotten that he was ever a little wrinkly nugget like that! These days he is so....hale and hearty, I guess is the best way to describe him. Smiles that take up his whole face. Constant thrashing “exercise” routines. Fascination with everything around him. If the first three months brought us to this point, I can’t imagine what he’ll be like in another three! I’ve mentioned our Ikea Leka baby gym before--for weeks I’ve been putting Tucker under it to look up at the toys and, eventually, bat at them a bit. Mostly he’d thrash his hand into the spinny bits on the sides and gradually push the whole thing forward. Then, on Monday, he suddenly figured out the toys. He went from ignoring them to grabbing on for dear life overnight. 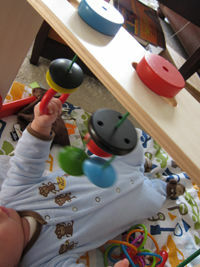 I also remembered that I’d gotten him an Oball, which seemed like it would be great for grabbing. He immediately went for it, though it doesn’t compare to his beloved Winkel, since it’s far harder to shove into his mouth, especially if he’s trying to cram a fist in alongside it. We’ve been doing lots of at-home playtime because I’ve finally gotten Tucker onto a decent nap routine. I’ve been stricter and stricter about making sure he goes down after an hour and a half to two hours awake, and with every passing day it seems to get easier. Of course, the downside is that I am a lot more constrained in terms of outings, because he really needs to be in the crib (or on a long car ride) to nap these days and yet he’s still taking four 35-45 minute naps, chaining me to the apartment. But I have faith that the nap consolidation will happen eventually--it has to! By the way, I meant to mention last week that I’ve finally got my systems down for nursing in public. It was a big issue over the holiday week since we were at my mother-in-law’s house with lots of people around, and then my parents and brother were visiting, so even at home I needed to cover up more than usual. A while ago the people who make Bébé au Lait nursing covers got in touch with me and asked if I’d like to try out a cover. I didn’t reply at first, because frankly I’d always made fun of the covers. They seemed like overkill; too big, and unnecessary if you just kept a shawl handy. True enough, when Tucker was little. But as he got bigger he got a lot better at yanking the shawl down, and I was sick of struggling to keep covered while nursing in, say, the Boston Public Garden. I emailed the woman back and said I’d love to try a cover. And I have to eat my words--I love it. I still feel kind of dumb when I’m using it (I’m That Girl! The one who is so intent on covering up!) but I also didn’t have to be worried about nursing in the living room while my dad and brother were in my house, so....score. I have also really liked the stiffened neck opening, which lets me see Tucker without moving the cover aside like I had to with a scarf. Oh, and since it goes around my neck with an apron-style band, he can’t yank it down no matter how hard he tries. And he’s tried. The prints are large-scaled...I got the purple “Royale” pattern and it’s very nice; pretty subtle and not tablecloth-ish. Oh, and for a cushion to support him when we’re nursing outside the house, I stuff a receiving blanket or two in my beret, and lay a burp cloth over it. Perfect! The hat keeps the blankets from escaping when he wriggles around. The wheel of the locked stroller makes a good nursing “stool” for my short legs.